China's yuan is expected to play a bigger role in regional trade with the China-ASEAN Free Trade Area (CAFTA) becoming effective on Jan 1, 2010. "The upcoming CAFTA, which boasts the largest population among all the world's FTAs (free trade areas) and allows zero tariff on 90 percent of products traded between China and ASEAN (Association of Southeast Asian Nations), will quicken the process of renminbi regionalization," said Xu Ningning, executive secretary general of the China-ASEAN Business Council. Free trade demands a free flow of currency, making possible the regional use of renminbi, he said. Alongkorn Ponlaboot, Thailand's deputy minister of commerce, said he believes the renminbi will play a more important role in bilateral trade between China and ASEAN in the future. The messages of Xu and Ponlaboot came from the annual China-ASEAN Expo in Guangxi Zhuang autonomous region late last month. Ponlaboot said the yuan was a very stable currency and expanding its use could help reduce risks faced by the ASEAN countries in using the US dollar, which has become highly volatile as a result of the global financial crisis. Pung Kheav Se, general manager of Canadia Bank Plc of Cambodia, echoed Thailand's deputy minister, saying trade between China and ASEAN was growing and the use of renminbi would benefit both sides. 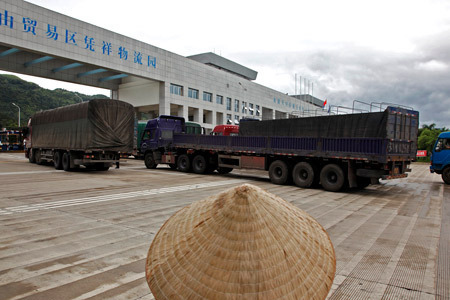 Data from China's General Administration of Customs showed trade between China and ASEAN totaled $105.88 billion in 2004, and rose to $231.07 billion in 2008. China and ASEAN are currently each other's fourth-largest trade partner. However, the use of yuan in ASEAN countries fell far short of the trade growth between China and ASEAN members. Currently, renminbi settlement is mainly adopted in border trade, which accounted for only 10 percent of China-ASEAN bilateral trades, said Teng Chong, board chairman of Guangxi Beibu Gulf Bank. Pung Kheav Se said renminbi, US dollars, Thai Baht and Vietnamese Dong currently are in circulation in Cambodia, but that the amount of yuan is small, mainly used for tourism and small commodity business. He did not give specific figures. The main reason was that Cambodia is not a developed economy, and some people have inadequate knowledge about the yuan, he said. He suggested that China should gradually establish a credit system and settlement mechanism for yuan in ASEAN, and then expand its use globally. Su Ning, vice governor of China's central bank, said financial cooperation between China and ASEAN members was still at the initial phase, and added that financial markets were not open enough. But the potential for cooperation is huge, as finance in China and ASEAN is seeing fast development, he said. China has launched pilot renminbi programs over the years, but the pace has obviously quickened since the onset of the global financial crisis as the US dollar has been getting weaker, arousing concerns that an unstable dollar would lead to increased costs and risks for traders.